If you think you might need a hearing checkup, you probably do. This Special Health Report, Hearing Loss: A guide to prevention and treatment, contains in-depth information on the causes, diagnosis, and treatment of hearing loss. You'll learn how to prevent hearing loss and preserve the hearing you have now. You'll also learn about the latest advances in hearing aid technology and find out which kind of hearing device may be best for you. Hearing loss can be isolating, frustrating, and embarrassing. In addition to taking away daily pleasures, it can also threaten your independence. 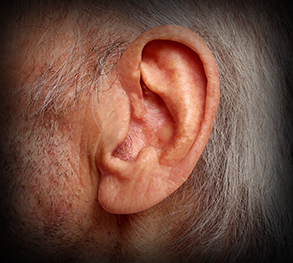 Age-related hearing loss affects one in three of us by age 65. That shouldn't be surprising. We’ve punished our ears with a lifetime of noise — from lawnmowers and hair dryers to car horns and loud music. But even as technology may have accelerated hearing loss, it is also offering unprecedented help. New hearing aids — some as small as a jelly bean — are producing greater amplification with less distortion. And surgical advances are providing alternate ways of restoring hearing. Hearing Loss: A guide to prevention and treatment gives you a useful understanding of the causes of hearing impairment as well as of the breakthroughs that are helping men and women to minimize the consequences of hearing loss. This Special Health Report, prepared by Harvard Medical School doctors, will brief you on how hearing loss is measured. It will prepare you to work with an audiologist for an accurate diagnosis, help you determine what to look for in a hearing aid, and offer steps to take to prevent further damage. The report will also demonstrate which medications can contribute to hearing loss, describe what to do for a burst eardrum, and reveal how treating hearing loss can protect your brain from decline and possibly even from dementia. If you think you might need a hearing checkup, you probably do. This Special Health Report describes the causes and cures for hearing loss. You’ll learn about the latest advances in hearing aid technology and find out which kind of hearing device may be best for you. 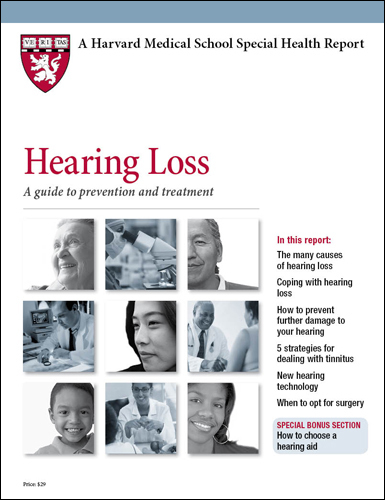 This report also contains in-depth information on the causes, diagnosis, and treatment of hearing loss. You'll learn how to prevent hearing loss and preserve the hearing you have now. Everyone has had this experience: someone is talking to you, and you can hear the words loudly but not clearly. The problem is especially common when you’re trying to have a conversation in a noisy room. But with age, many people have this problem even in quiet settings. The words are loud, but they sound garbled. A speech discrimination test assesses how well you understand words. For this test, the audiologist has you listen to words through the headphones at a decibel level louder than your speech reception threshold, so you won’t have any problem with the volume of the speech. This test uses one-syllable words with vowels and consonants that are distributed similarly to those of words used in ordinary conversations—words such as jar, this, and box. The audiologist asks you to repeat the words you hear. Successfully repeating 90% or more of them is considered excellent. Although it doesn’t mean your hearing is good, a high score on the speech discrimination test is good news. It means that you stand to benefit the most from a hearing aid, because boosting the volume of words will help you understand them better. In other words, your problem is mainly volume, which a hearing aid can fix. If you understand only a low percentage of the words, simply turning up the volume with a hearing aid is unlikely to help you hear any more clearly. The main cause of difficulty with word discrimination is inner-ear hair cell or nerve degeneration. If your trouble understanding words is modest, a hearing aid may help to some degree, but it will not cure the problem. You’ll still need to use visual cues, such as lip reading, to help you understand what a person is saying. The more severe your problem is with word discrimination, the more limited your benefit from using a hearing aid.